At the final whistle the 84,168 fans at Camp Nou remained rooted to their seats in anticipation of the party on the field to celebrate the league and cup double and to say goodbye to Andrés Iniesta. An indication of what was to come came when the lights went out in the stadium and DJ Carles Pérez cranked up the music for the return of the players out on to the field. Drummers and inflatables with ‘Champions’ and ‘Infinit Iniesta’ written on them also formed part of the entertainment before the lights, colours and music gave way to the Barça first team squad and coaching staff. Last of all back out was none other than Andrés Iniesta. The Barça captain passed through the guard of honour formed by his team mates and coaches. The presidents of the Catalan Football Federation and the Spanish Football Federation, Andreu Subies and Luis Rubiales respectively, presented the 2017/18 league trophy to Andrés Iniesta. Then, the midfielder’s family presented him with a special shirt commemorating his final game as well as a photo of the Barça number 8 with the 32 trophies that he has won with FC Barcelona. Andrés Iniesta took the microphone at Camp Nou visibly emotional as he came to the end of more than two decades at FC Barcelona. “Today is a difficult day after 22 years here. It’s been a pleasure and an honour to defend the badge, for me, the best in the world,” said the midfielder amidst the applause of the fans. The Barça number 8 also thanked his team mates and the fans for the support shown to him during his time at the Club. “I want to thank all my team mates, I will miss you very much. I came here as a boy and I leave at 34 years of age a man. Thanks to everyone who asked me to stay, you will always be in my heart,” said Iniesta. 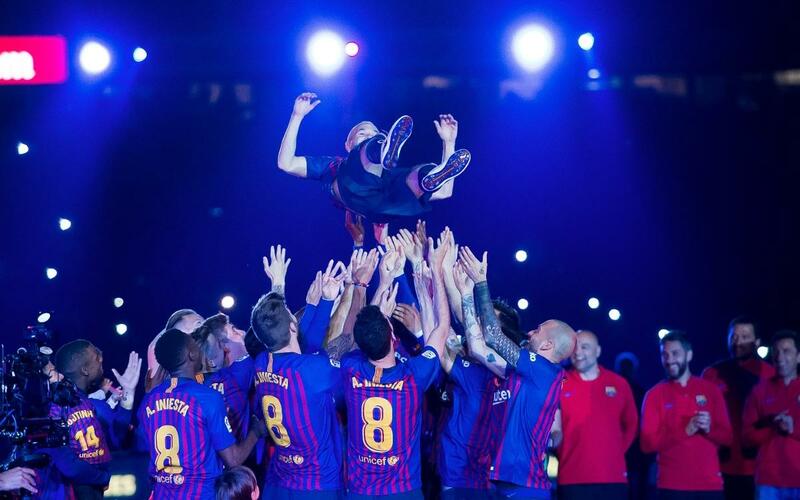 To round off the festivities, the first team performed a lap of honour to celebrate the league and cup double and the departure of Andrés Iniesta. The lap ended with a firework display and the captain sat in the centre circle of the pitch at Camp Nou enjoying his final moments as player with a heart that will always be Barça.